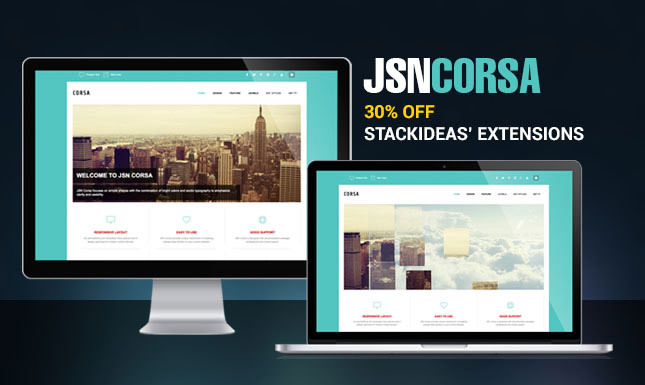 JSN Corsa - Leverage your social website with 30% OFF StackIdeas’ extensions. JSN Corsa template is out. Just kick-start your powerful social website with an exotic design together with a trinity of the most revolutionary extensions from StackIdeas: EasySocial for social networking, EasyBlog for blogging and EasyDiscuss for Q&A with Forum features NOW! Just become a customer of JoomlaShine (When you purchase JSN Corsa template or any other JoomlaShine product) to get 30% OFF three professional extensions from StackIdeas: EasySocial, EasyBlog and EasyDiscuss. You can find the 30% OFF code in the Customer Area -> Partners Discount! An online marketer at www.JoomlaShine.com. I write blog posts about Joomla-related stuff with the hope that they are useful for you in web design process. Friday, 10 January 2014 JSN Corsa - Leverage your social website with 30% OFF StackIdeas’ extensions. Monday, 23 December 2013 We are in hiring a Customer Support Specialist. Come and join one of the top Joomla template providers! Monday, 16 December 2013 Claim your Xmas goodies – an OSTraining course or an EasyBlog extension for FREE. Hurry up! Monday, 09 December 2013 JSN Glass template and HikaShop for your intuitive online store. Get a special sales bundle of these goodies!